2 February 2017 – The world is getting its first look at Donald Trump the Diplomat. He looks a lot like Donald Trump the Candidate, Donald Trump the Businessman and Donald Trump the Reality Television Host. He’s brash. He has a temper. He’s willing to say impolite things. He can be bullying or ingratiating, depending on his own internal calculations. Such attributes made him must-see television on The Apprentice. It helped him land blockbuster real-estate deals in boom times and stay one step ahead of financial collapse when business went bad. It’s an open question whether it will be effective as a way to assert national authority on the world stage. There’s no doubt, however, that it represents a sharp break from how US presidents have conducted themselves in the past, with carefully managed foreign interactions that seldom deviate from a prearranged script. Perhaps it’s better to say that what the world is getting is its first look at Donald Trump the Un-Diplomat. 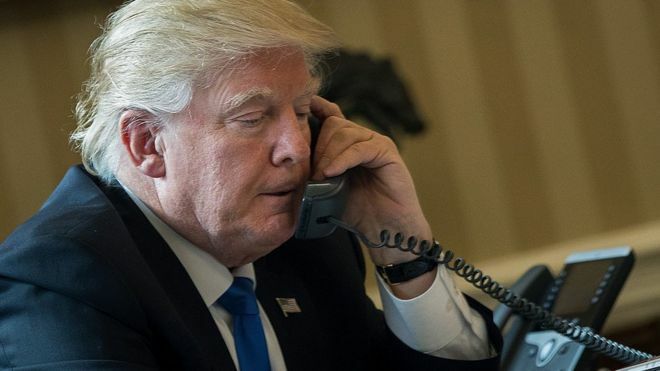 Multiple media accounts on Wednesday described Mr Trump’s recent phone conversations with Mexican President Enrique Pena Nieto and Australian Prime Minister Malcolm Turnbull, based on reports from senior government officials and leaked transcripts of the communications. The president told Australia’s leader that an agreement the Obama administration had negotiated to admit entry of more than a thousand refugees currently detained in Australia was “the worst deal ever” and described his conversation with Mr Turnbull as the “worst call by far” among those he had conducted with world leaders that day. The discussion, scheduled for an hour, ended after about 25 minutes. In his call with Mr Nieto, Mr Trump reportedly said Mexico “had not done a good job” knocking out its “bad hombres”. An Associated Press article reported that Mr Trump had threatened to send US troops into Mexico, but other media outlets were unable to confirm this or said the remark was made in jest. In both episodes, Mr Trump reportedly took time to boast about the size of his inauguration crowd – a recurring theme in his public remarks since becoming president. Accounts of the conversations differ dramatically from the official White House readouts, which paint a sterile picture of leaders embracing the “enduring strength and closeness” of their nation’s relationships and discussing common interests. According to CNN report Jim Acosta, however, the reality is far different, as a source told him Mr Trump’s conversations “are turning faces white” in the White House. A subsequent tweet by Mr Trump condemning the Australian refugee agreement seemed to confirm that the Turnbull conversation was more contentious than the original readout would indicate. The morning after the reporting double-whammy – further evidence that this administration already leaks more than a Swiss-cheese boat – Mr Trump addressed the swirling controversy. It’s the kind of in-your-face attitude that Mr Trump’s supporters have long said they admired and wanted in the White House, although it has left much of the traditional foreign policy establishment stumbling to the fainting couches. Mr Trump’s foreign interactions haven’t been all tough talk, however. A few weeks after his surprise election, Mr Trump spoke with Pakistani Prime Minister Muhammad Nawaz Sharif and, according to that nation’s readout of the conversation, the then-president-elect was effusive in his praise. In his 1987 book, The Art of the Deal, Mr Trump explained what he saw as the keys to good negotiating. One of them was to be nice, but “fight back hard” if you think you’re being treated unfairly. Another is to never show weakness. Donald Trump the Un-Diplomat seems to be putting those maxims to use early and often in his global interactions – no matter who is on the other end of the line.